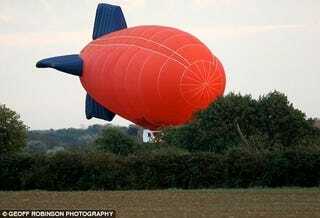 England is in uproar after James May's obviously staged blimp stunt on Top Gear last Sunday was revealed as a fake. The segment featured a police helicopter intercepting May as he flew into an active airport in a homemade airship. Stirring up a scandal, the country's second largest newspaper, The Daily Mail, is breathlessly reporting the news, saying stuff like "fakery row," "orchestrated fake" and "set up." "The whole event was set up," said the man who provided the fake police helicopter. "It was completely scripted, there was no real emergency - we were hired to play along." Continuing to explain that while it appeared that May, who has no experience flying airships, was in control, a professional pilot was actually in charge during the trickier maneuvers. Incredulous that viewers don't realize Top Gear is a scripted television show, a BBC Spokesperson responded, "As an entertainment programme, Top Gear prides itself on making silly films that don't pretend to represent real life. Any suggestion it deliberately misled viewers is patently ludicrous."